I like to let my kids go for trial enrichment classes when I can afford the time. It's not because of the fact that these classes are complimentary or sponsored, or that we are running out of ideas of what to do at home; but because of the fact that I like to expose them to different activities, to enable them to learn along the way and have the opportunity to discover their likes, preferences and passion in life. The thing about going for these classes is that it gets challenging to determine after one term whether your child truly likes it or not. That is, unless your child absolutely dreads it and when he/she does not look forward to class and finds ways to skip it, I take it as a sign that it is time to stop. It becomes even trickier when you want to assess how much your child has improved or benefited from one term of lessons because it usually takes longer for results to show. Remember I wrote about how Ariel started going for her first class at My Little Genius? You can read about the company background, classroom set up and lesson contents in my previous post here. We were lucky to be able to continue with classes for another term and guess what, her last lesson happened to be on the day that I gave birth to baby Asher! In this post, I'll be sharing with you on how I think she has progressed from Day 1 and the things we like about My Little Genius. Firstly, Ariel seems to have a stronger desire to learn! To instill a love of lifelong learning, you must first like to learn, right? 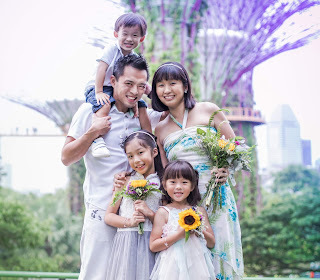 As parents, I think it is crucial for us to try to cultivate a love of learning in the kids from as young as possible. Thus, I was very relieved to see that my three-year-old looked forward to every of her lesson at My Little Genius. Never once did she grumble or say that she didn't want to attend class, and in this second term, her attention span has improved and she surprised us week after week by being absolutely attentive and in high spirits for the entire 70-minute lesson. We tend to drive past this road pretty often to get home and every time we do so, she will sit up straight, look out of the window and happily exclaim when she sees the big yellow signboard "That's my class, My Little Genius, see see?" (she tends to pronounce it as Ge-ni-a, which makes us laugh every time). She also remembers the songs that she learnt in class and will sing them for us whenever she is free at home. I think these are signs that she really liked going for the classes and thoroughly enjoyed her weekly sessions with her teachers. Secondly, one other thing we noted was that her memory has improved! Now, I can't say for sure that all of the credit goes to the memory activities and games that she does at My Little Genius but they definitely played a significant role over the past months. When she just started, she would sometimes make a mistake especially when the kids were only allowed to see the pictures at two 1-second intervals. However, over time, it was evident to us and the teachers that she got better and better at the memory activities and towards the end of Term 2, she did not have to depend on us and could achieve a perfect score most of the time. I was also pleasantly surprised to see how much more she enjoyed the linking memory activity (linking different words in sequence through a make believe story) this time round and at the end of the term, she could memorise a good 30 out of 40 words! Not bad, right? Giving a victory sign when she got it all correct! Last but not least, she has also developed more self-confidence in class. I remember that in the first term, she was still very much reserved and since we usually went on a non-peak weekday morning, most often than not, she was the only student and had a one-on-one session with the teacher. She would be shy when the teacher posed her questions and would look down or turn to me for answers, and her loud voice would only be heard during the singing of nursery rhymes. In the second term, we switched to a weekend class and there would usually be 2-3 other students as well. I think that helped to ease her into the surroundings a little more and now that she was more accustomed to the teachers and the contents of the lesson, she became more confident and enthusiastic when it came to answering questions. She also became more independent during the craft and motor skill activities and would insist on doing things on her own without my help too, which I was more than willing to oblige knowing that my little girl was slowly growing up. As mentioned in the first post, the lessons are conducted in English and Chinese, and alternate every week. This means that every kid will be exposed to both languages and I find that this helps them to be more bilingual at this young age. 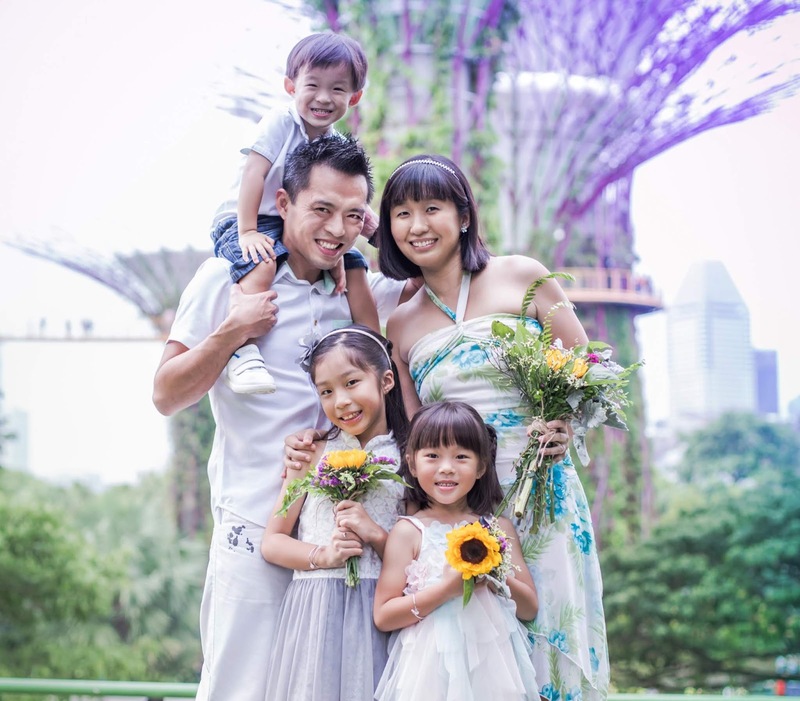 Unlike most of her peers, Ariel speaks more fluently in Mandarin than English so she actually picked up more words in her English vocabulary after attending the classes here. I have been amazed on more than one occasion on how creative and fun some of the activities can be. This is especially so when it comes to craft and motor skill activities where the teachers would provide unique, cute-looking props to let the kids learn through play. Below are just some examples. I would definitely love these activities if I were a small kid and they would help to pique my interest and make me excited to keep going! Cooking a steamboat using chopsticks - fishballs were made of cotton balls, vegetables made of felt, noodles made of string and there was even a make believe stove and pot! Barbecuing food for Mummy and learning to use the fan - we had sausages, fillet, fishballs and marshmallows! At such a young age, I think it is important for children to know that it is okay to make mistakes. In fact, mistakes are good because that means we will learn from them and be better the next time. What I like about some of the activities is that they allow the child to try, to experience, to go through trial and error, to make mistakes before finding the correct answer. This is very much evident through some of the math activities and puzzle solving activities. Every term, there will be a Genius Olympiad and based on the chosen theme (linking memory, IQ, tangrams, words etc), the teachers will let every child carry out that activity and record their scores. The children with the best scores will be announced on the bulletin board and even if you don't win anything, you get a certificate for trying your best! Ariel was definitely proud to receive her first certificate and I was proud to know that she didn't give up. Every 70-minute lesson is packed with activities and they are pretty fast paced, which means that the little ones seldom have opportunities to feel bored. I like the fact that My Little Genius takes time and effort to come up with exciting class contents and children get to participate in a wide variety of brain stimulating activities. From Math, Science, puzzles, writing, story telling, maze, art and craft, motor skills, IQ and memory games, song and dance, there are just so many things that each kid gets exposed to in just one session. In fact, you always get to see new themes and new activities in every class and they excite not just my kid, but me as well! Lastly, I like the fact that the lessons are parent-accompanied, no matter if you are bringing a 6-month-old or 5-year-old. That means that I get to spend some quality time with my child and we play, bond, laugh, sing, dance and learn together. For me, this was the perfect time to cherish my one-on-one time with Ariel because very soon, the baby would have arrived and it would not be possible to do so then. In the second term, I also asked the hubby to take her for some of the classes so that they could have some daddy-and-daughter time together too! 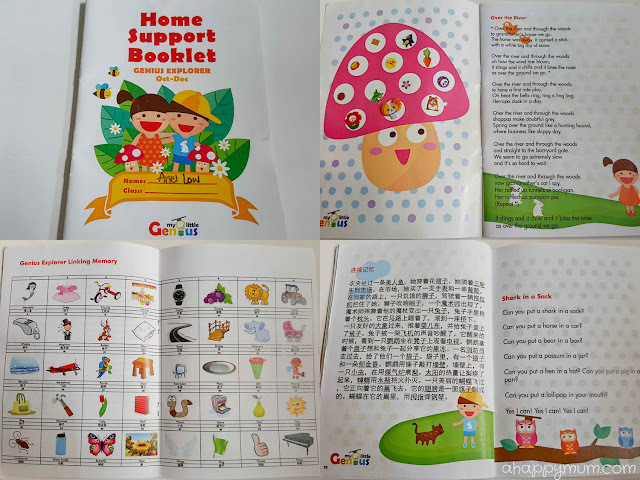 The teachers would also encourage us to revise with our kids at home and every kid gets a Home Support Booklet which contains lyrics of the songs they learn in class (both English and Chinese), the pictures and words used in linking memory, the new vocabulary introduced and even the dance moves to some of the songs! I find this very handy when my girl wants to practise the songs or the linking memory activity at home. She also takes pride in all the stickers she has collected inside, one for every class she attended! So, with a tinge of regret, this marks the end of our journey with My Little Genius, for now at least. We have created some very fond memories over the past six months and the classes have been nothing short of enjoyable and beneficial for my girl. I am thankful that she is off to a great start and I do hope that she will continue to develop a love of learning. Because that is what will take her far in life. For those of you who wish to let your child try out lessons at My Little Genius, good news! 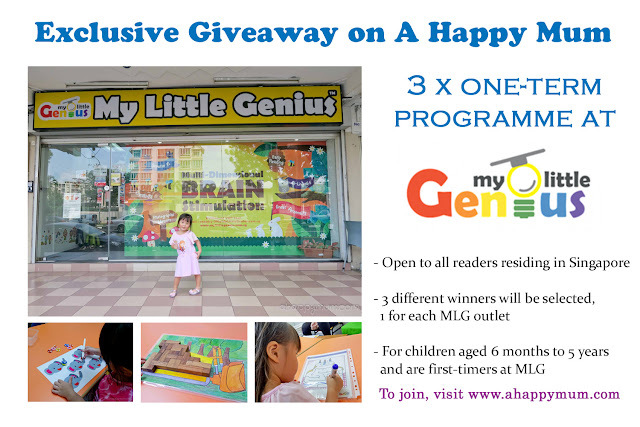 A Happy Mum is giving away complimentary ONE-TERM programmes to THREE readers! - One term consists of 12 lessons, each lesson is 70 minutes long and takes place weekly. Lessons are conducted in English and Chinese, and alternate every week. Indicate in the Rafflecopter widget below that you have done so and to increase your chances of winning, you can choose to carry out the rest of the options. Good luck! Disclosure: This is Part II of a sponsored collaboration between My Little Genius and A Happy Mum. We were invited to review Genius Explorer and Ariel attended two terms of complimentary lessons in return. All opinions are ours.